← What’s new with Osa Conservation? OC’s conservation efforts in the Térraba-Sierpe wetlands have gotten off to a great start! Our wetlands program, started earlier this year, aims to strengthen the presence of government and conservation organizations in the Térraba-Sierpe National Wetlands and to develop sustainable economic opportunities for neighboring communities. In addition to housing a diverse array of wildlife, wetlands perform important ecological functions – from water filtration to carbon storage. Mangroves in particular can sequester up to four times more carbon than tropical rainforests, making them the best protection against climate change1. Wetland ecosystems can also act as as environmental buffers – and their role in this capacity was highlighted earlier this month in the form of super typhoon Haiyan, which tore through the Phillippines on November 7. Possibly the most intense tropical cyclone on record, the storm flattened nearly 80% of Tacloban City’s buildings and has killed almost 4,000 people2. Having cut down over three quarters of its mangrove forests in the last century3, the Phillippines have become increasingly vulnerable to storms such as Haiyan. Mangroves provide essential protection from tropical storms, acting as a barrier that can absorb up to 70 – 90% of the energy of wind-generated waves in storms like this one4. If the Phillippines hope to survive an increased onslaught of tropical cyclones, they must act fast to recover their “green belt” of protection. OC’s Wetlands Program Coordinator Ándres Jiménez recently had the opportunity to spend time with a world-class mangrove scientist from the Phillippines, who shared with him her country’s strategy for protecting their remaining wetlands and restoring what they have lost. Read on for more about her visit and Ándres’s thoughts for the future of wetlands conservation in Costa Rica! Recently I had the opportunity to spend time with Doctor Georginne Primavera, a world-class mangrove scientist from the Philippines. A quiet yet cheerful scientist, she shows a special glitter in her eyes every time she talks about mangroves. After more than 40 years of working with these trees, she still smiles when showing a picture of herself climbing one. 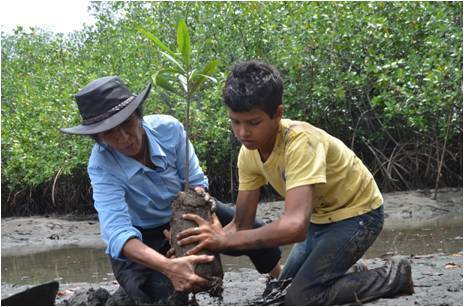 Dr. Primavera plants a mangrove tree with a local boy. I have to admit, at this moment I had no idea of what was happening in the Philippines. The only vague concept I had about the country’s natural resources were the awesome coral reefs surrounding the 7,107-island archipelago. Never had I expected to learn so much from such a short experience. After one meeting and three mind-blowing presentations, I came to have a grasp on the situation. The Philippines is a country characterized by the protection of its coral reefs with simultaneous destruction of its wetland mangrove ecosystems. Due to overfishing in the oceans and the immense pressure of overpopulation (close to 100 million people in a land area of 300,000 km2 – meaning 308 inhabitants per square km! 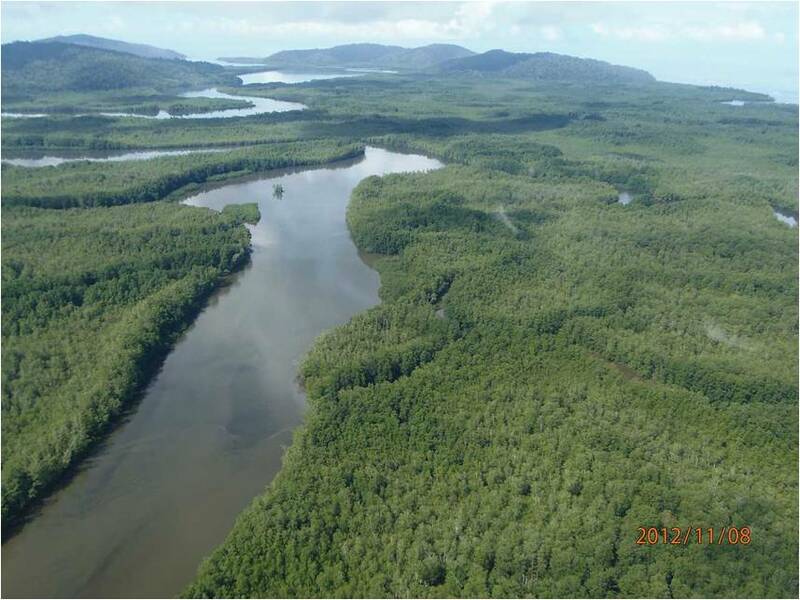 ), vast amounts of mangrove forests were cut down and replaced with aquaculture ponds, among other things. These ponds were meant to supply the growing nation with the protein source they could no longer find in the oceans. This situation generated a long list of ailments for the country, the main one being increased typhoon vulnerability. By removing the vegetation (in this case, mangroves) from coastal areas, you leave an open path for these destructive climate phenomena to hit cities, towns and human structures directly. Destruction of this “green belt” of protection has dramatically increased the number of damages from these types of phenomena. In 2009, Typhoon Pepeng left up to 375 people dead and cost the country 27 billion pesos (630 million dollars) in damages5. Taking into account climate change and the fact that the Philippines are hit with an average of 20 typhoons per year6, this country is facing a dangerous climatic situation. However, there is a silver lining to this story. The Philippines has begun to gradually recover its green belt of protection through combined efforts from the government, NGOs, and local communities. Filipinos have adopted a community-based mangrove management scheme, where the community handles a certain amount of mangrove land, looks after it, protects it and profits from it. The government takes charge of regulating and authorizing the use of the land, the communities are in charge of the active management of the land, and NGOs, the third piece of the puzzle, provide the core for articulation of efforts and much-needed community capacity-building. All three groups benefit from the results of these efforts, making it a win, win, win situation – a triple win for the Philippines! In an ideal world, this system would be perfect, but is it really? Even though this Asian country has been successful, it has also had stories of failure, where the community fails to join in, or a new local government comes into power and the efforts for mangrove conservation get forgotten. In other cases the NGOs involved just think about their own benefit and either exit the project too soon, before the community is ready to handle the challenge, or stick around for too long, crippling the leadership of the locals. My point here is that no matter how you see it, the country is starting to realize mangroves are vital for their well-being and are slowly correcting a historical mistake using very interesting participative models. As a matter of fact, the mangroves are so valuable now, that Filipinos throw massive weddings organized by the local government, where, if you plant some mangrove trees, you get married for free. 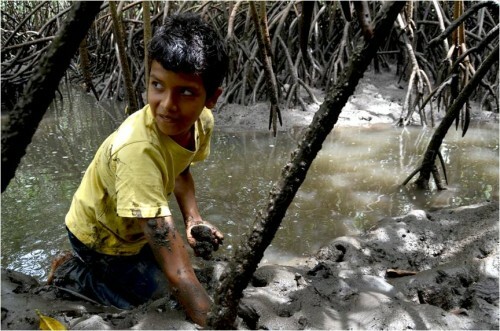 A local boy collects molluscs, a traditional Costa Rican lifestyle in mangrove forests. Here comes the Costa Rican case, with 25% of the country’s territory under some kind of environmental protection, strong civil participation and a wiling (in most cases) government – yet, in environmental management, Costa Rica is falling behind. Yes, Costa Rica has been very successful in protecting natural areas but has a different historical debt than the Philippines. The country has only been able to create, structure and implement management systems based on “upward-down models”, where the establishment, management and regulation of national protected areas comes only from the government. This means that making the Philippines’ model a reality in Costa Rican wetlands is far from happening, as the laws ban the management of government land by civil society. Is this a problem? If you ask me, I think it is. Currently the country, and, I would dare to say, the world, needs for the communities and locals that live and experience the natural resources firsthand to feel empowered for their well being and to understand that good ecosystem health means good human population health. I think wetlands are a great place to start with “triple win models.” Wetlands provide enormous amount of ecosystem services, act as climate buffers, protect water sources, function as food sources and clearly have a huge importance in transportation, among other things. Even more, wetlands have been an important landscape for humans since ancient times. Certainly the extreme climate phenomena pressure that moved the Philippines to action is not as critical in Costa Rica, but this is no excuse to not move forward in different, more successful management models. Important changes are necessary to successfully implement this in Costa Rica, such as legislation changes, governmental attitude modification and above all civil society awareness and involvement. With active involvement of the civil society, more effective management can take place. Local capacity-building and awareness will be decisive on the success of these models. Keep following our blog for more news and updates on our wetlands conservation program! This entry was posted in Community Outreach, Environmental Education, Land Conservation and Forest Restoration, Marine Conservation. Bookmark the permalink.